Angie is an award-winning, bestselling author who firmly believes that words flow through her veins. She lives in Calimesa, California with her husband, two cats, and beloved dog. She also has two sons paving their own way in the world. She grew up in Wichita, Kansas and has lived all over the United States. Her work reflects her background in criminal justice and her love of Midwest life. She has released four novels in the suspense/thriller, paranormal/supernatural thriller, and horror genres. She also has a poetry/short story collection, a horror short story collection, and has contributed short stories to multiple anthologies. 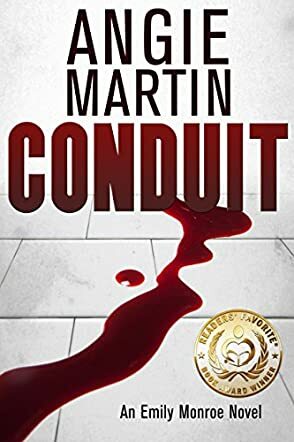 In Conduit by Angie Martin, Emily Monroe is a private investigator along with her best friend and fellow investigator, Cassie Reid. She's also a psychic and sometimes uses her abilities when she is helping the Wichita police on a case. This particular case involves a serial killer who brutally murders his victims and has so far managed not to leave any evidence of his crimes. But what Emily and the police don't know is that the killer's real target is Emily herself and he's hoping to use the murders to bridge a psychic connection with Emily, eventually taking over her mind and having her all to himself. As the murders pile up, it becomes a race against time to find him before he kills again and captures Emily's mind completely. I enjoyed Conduit by Angie Martin a lot. The writing was great and I really enjoyed the friendship between Emily and Cassie. I also liked the more psychic side of things. Emily hasn't fully come into her abilities, especially since she'd been suppressing them for quite a while, and it's interesting to see how she handles that as she's helping the police capture the killer. I also was happy that this wasn't going to be a book where the heroine picks up an errant strand of fiber and solves half the mystery. The suspense kept me on the edge of my seat and each woman taken left me fervently hoping that they would capture the killer in time. Can't wait to see what else Angie Martin comes up with.